Wines are usually made from grapes and from the yeast that is needed to transform the grapes’ sugar into alcohol. Popular white wines that are made from grapes include albariño, chardonnay, sauvignon blanc, chenin blanc, pinot blanc, pinot gris (or pinot grigio), and viognier. Popular red wines that are made from grapes, on the other hand, include cabernet franc, cabernet sauvignon, sangiovese, syrah (or shiraz), grenache, merlot, pinot noir, and zinfandel. Wines that incorporate the color from grape skins, but not enough of it to form the color red or white, are called roses. Grapes that are turned into rose wines also include pinot noir and zinfandel. It was mentioned that yeast is needed in order for the sugar in grapes to become alcohol. Many vineyards like to utilize indigenous yeast of grape skins, because each grain can result in a different combination of yeast strains, which in turn may help produce more unique and complex wines. Most vineyards, though, use commercial yeasts, because they are known to be tolerant of high-alcohol environments, which can result in incomplete fermentations. When fermenting wine, vineyards usually add enzymes to wines to alleviate concerns of spoilage that is usually caused by the growth of bad yeasts. There are even enzymes that when added to young wines, allow for better filtering, thus contributing to a higher yield. These enzymes can be found in beaujolais nouveau. Wines undergo a process called fining, which is basically filtering, but with the filtering drifting down through the wine as compared with the wine being forced through a physical filter. Among wine’s fining agents are clay, gelatin, silica, and white egg albumin. Wines contain tannins, which come from the seeds and skins of grapes, and also from wooden barrels that can be utilized to age wines. They act as a preservative and can make your mouth pucker and your mouth feel dry. Red wines, such as cabernet sauvignon, syrah, and nebbiolo, and the red wines from Bordeaux and Tuscany, Italy, are usually the ones that are high in tannin content. Wines also contain polysaccharides, which help retain the coloring and flavoring of compounds that are obtained from grape skins. They also have gum arabic, which is used to lock in the aromatic compounds in a wine, and sulfur, which is used as an anti-oxidative preservative. Flavonoids, which are found in wines, stop the formation of reactive oxygen species (ROS) in skin cells that are often exposed to the harsh rays of the sun. This is a good thing because ROS enables “bad” enzymes to harm otherwise healthy cells. 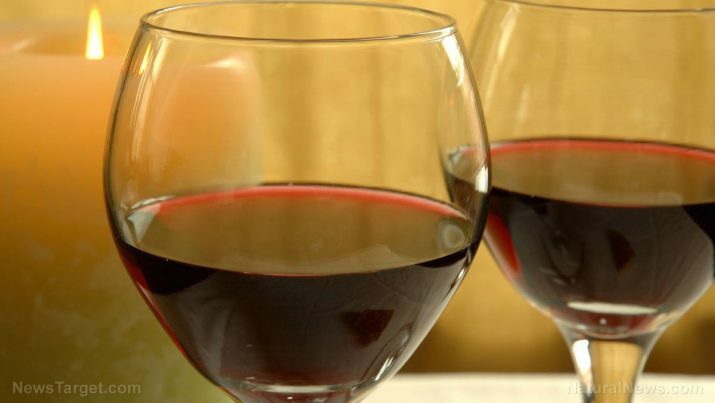 Red wine contributes toward healthy skin. A study that was published in the journal Dermatology and Therapy concluded that the resveratrol found in wine can act as an effective treatment for acne. Wine is good for the cardiovascular system. This is due to its resveratrol content. Resveratrol lessens the stickiness of blood platelets, helping to keep blood vessels open. Foods that are rich in resveratrol include grapes, blueberries, and peanuts. In addition, researchers at Johns Hopkins University School of Medicine concluded in a study that was published in the journal Experimental Neurology that red wine can help guard the brain from stroke damage. Here are some wine recipe ideas that you would surely enjoy. Wine and chocolates? Why Valentine’s Day is actually the healthiest holiday! Wine is good for the cardiovascular and nervous systems. Wine contributes towards healthy skin.